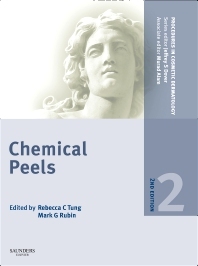 The 2nd Edition of Chemical Peels, by Drs. Mark G. Rubin and Rebecca Tung, shows you how to get great results by performing the newest techniques and treatments. Explore new chapters devoted to body peeling, review adjunct therapies and various methods used internationally, master chemical peeling for darker skin types, and examine case studies with before-and-after clinical photographs. Complemented by procedures captured on DVD, this new edition in the Procedures in Cosmetic Dermatology Series lets you offer your patients the best skin rejuvenation methods available today. Learn the "tricks of the trade" from practically minded, technically skilled, hands-on clinicians. Review a wealth of color illustrations and photographs that depict cases as they present in practice. Improve your technique by examining common pitfalls and how to optimize outcomes.